July 7, 2014 - For 450 years, no one knew where the Swedish warship Mars, named for the Roman god of war, sank in the Baltic Sea. The largest vessel of its time went down in a fierce battle in 1564 with more than 800 people aboard. 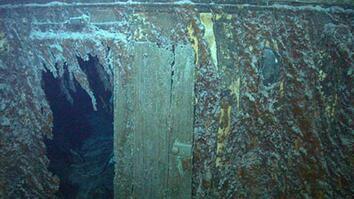 Its discovery in 2011 yielded an astonishingly well-preserved ship, including the seamen who went down with it. Legend has it that the ship was cursed because its cannons were made using metal from melted-down church bells. For a full news article about the Mars and its legend, click here. For more about the Mars discovery and the project to study it, click here. Mars sank during a fierce naval battle. 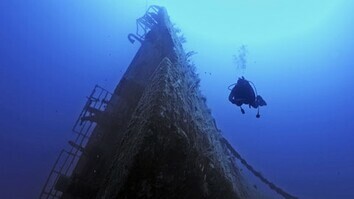 As you’re descending towards the wreck, you’re actually jumping into a time machine. In this case, 450 years back in time. We think Mars probably was the biggest warship of its time when it was built. It was the legend surrounding the Mars that go me intrigued as young boy. I wanted to find her and kind of see if the legend was true. But it was also the challenge as it were to find a shipwreck that many other people had tried to find but actually failed. It’s part of a quite war. It’s called the Seven-Year War where Denmark and Germany were fighting Sweden together. And it’s about control over the Baltic Sea. Control over the trade on the Baltic Sea and the power of the Baltic Sea. Mars is of course a ship but it is also a battlefield: a frozen battlefield that went down just in the middle of this fight. It was an explosion on board so the stem part was opening up so we think it went down very quick. In order to find Mars, we used state-of-the art side-scan sonar systems. 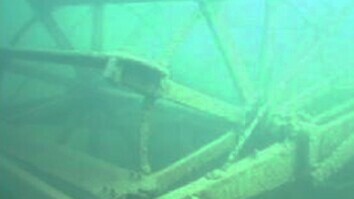 So the wreck is resting at 250 feet in a remarkable state of preservation. The cold and very dark water in the Baltic Sea preserves wrecks in a fantastic way. So you can see all the details on all the decorations on the gun and also the coat of arms of the king. So the legend about Mars does not only involve her size as a battleship, it also involves big silver treasure—a war treasure. A we actually started to find traces of that treasure. We have started to find silver coins. We know that one of the silver coins is estimated valued at 13,000 euros. And since there are 220,000 of them, according to our records, it becomes quite a heap of coins and value. We believe that more than 800 soldiers and sailors actually followed Mars when she sank down to her grave. So there is quite a few human remains down there, making the wreck site even more eerie to dive. You can see lots of bones from these people down there. So the bones are surrounded by the charcoal from the fire and the impact from the cannon balls and so on. So these people are laying right in this frozen battlefield. I think that’s a quite interesting part of this story that we could actually could study a battlefield from 1564.